$30 for a meltable movie prop might be a bit much, but if you’re a big Indy fan, this would be right up your alley. * Your quest ends here. An adventure-hungry archeologist and treasure hunter, Indiana Jones can’t resist the quest for a rare artifact. One such chase found Indy, along with Sallah and Marion Ravenwood, out to find the Ark of the Covenant. This superior resin bust of Ark-seeking Indy stands 7 1/2 inches tall and comes with a hand-numbered certificate of authenticity. It’s a limited edition. 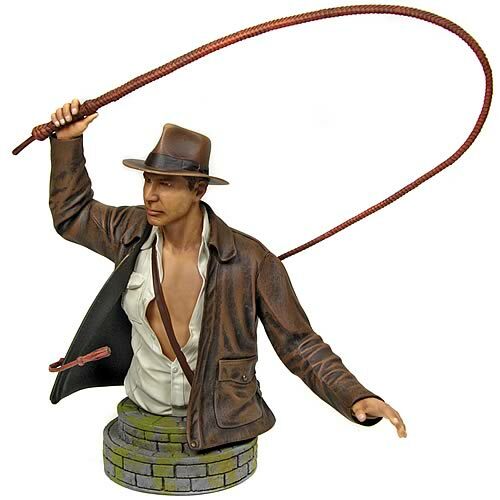 Your quest ends right here with this terrific Indiana Jones collectible! Limited edition to 5,000 pieces. * Stare into the idol’s eyes! * Let the Golden Idol from Raiders of the Lost Ark hold your pencils. * Indiana Jones prop replica and attention-attracting desk accessory. * Add a sense of classy, globetrotting adventure to your space! Stare into the idol’s eyes! Is it booby trapped? You don’t need to brave the Peruvian jungles and the temple’s deadly traps to stare into the idol’s eyes! 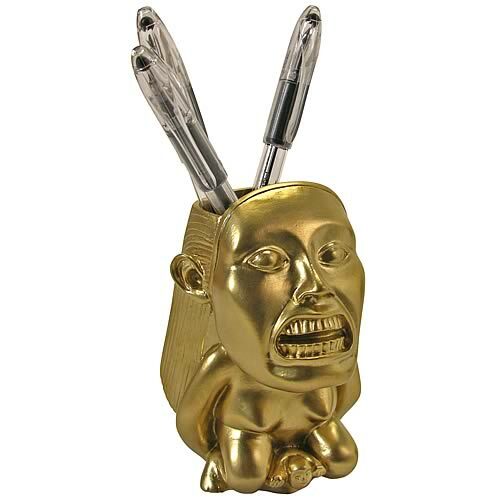 Modeled after the idol in Raiders of the Lost Ark and representing the Chachapoyan goddess of fertility, this miniature, gold-toned statue will hold your pens and pencils while attracting the attention of anyone who passes by. The pencil cup measures 4 1/2-inches tall x 3-inches wide x 2 1/2-inches long. It’s just one piece in the fine line of Indiana Jones desk accessories you can acquire. Why not collect them all and add a sense of classy, globetrotting adventure to your space? Other accessories sold separately. Note: The initial production run of this item will include a special Collector’s Card that will only be for that run and never made again! Year of Production: 2008 Manufacturer: Stern Production #: Unknown BRAND NEW! Shipped in original factory packaging. One-year factory warranty. Shipping: $350.00 Driveway delivery, anywhere in the continental U.S.